Massage is a therapeutic, touch-based treatment that has the power to do a world of good, and it’s not just for humans. Stress reduction, improvement of the circulatory system, and strengthening of the bond between human and pet are just some of the benefits of animal massage. 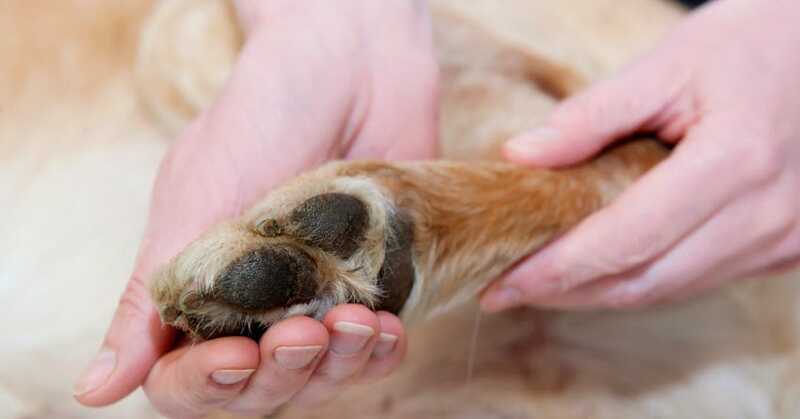 From pointers on treating specific conditions to general information about this wonderful practice, read on for an introductory guide to the benefits of dog massage. Regardless of whether you’ve got a senior dog or just brought home a new puppy, implementing a massage routine can be hugely beneficial. Regular massage helps the digestive system, promotes increased joint flexibility, stimulates the kidney and liver, and helps encourage healthy skin and coats. For dogs who have been injured or are recovering from surgery, massage can help with minimizing the amount of scar tissue, relieve pain, decrease swelling, and provide a sense of much-needed comfort. As with any form of treatment, always check with your veterinarian prior to beginning to ensure that it’s something that will benefit your dog. If appropriate, the following simple steps can be implemented at home. For more advanced treatment, your pet may benefit from massage sessions with a certified animal masseuse. Stressed or anxious dogs tend to draw tremendous benefits from pet massage. Carefully applied pressure and soothing, consistent touch provide a sense of comfort to animals who are otherwise unable to relax or settle themselves. When massaging an anxious dog, first ensure that the setting is one that promotes relaxation and calm. Turn off the television, avoid loud sounds (this isn’t the time to run the vacuum) and go to a place in the house that brings your dog comfort. Start by gently laying your hand on top of the dog’s head and softly brush it along the spine, all the way to the tail. Continue this stroke, gradually building up pressure, as long as the dog seems comfortable. Due to the gentle nature of this massage technique, it’s safe to do for a longer session. Keep going for as long as your dog seems comfortable, especially if you notice a reduction in anxiety. To finish, place one hand on the dog’s head and the other on his pelvis to trigger an additional degree of relaxation. Even puppies with seemingly infinite stores of energy will likely slow down if there’s a massage involved. Not only does it calm them, it provides the opportunity for a fantastic bonding experience between human and dog which helps foster a sense of trust and respect. When massaging a puppy, aim to time the treatment for when he’s at his calmest. It can be hard to pin down a little one during peak witching hour so try to plan accordingly. Begin the massage by gently stroking the puppy from the top of his head to his tail. Extend the strokes down his arms and legs, all the way to his paws. Gradually increase pressure, ensuring that he remains comfortable. Next, using your fingertips, gently apply pressure to the puppy’s muscles, gently kneading them to release tension. Avoid pushing on the bones, instead direct your focus to areas like his shoulders, back, and hips. Continue to alternate between the two techniques for as long as you and the puppy are willing to sit still. If you notice that your otherwise healthy and active dog is limping, the first step is to check with your vet to ensure that he isn’t seriously injured. If the limping isn’t the result of an injury, you may want to look to massage as a possible solution. Incorporating regular massage into your routine can provide relief from occasional soreness and help your dog loosen up without relying on medication or other more invasive forms of treatment. The first step is identifying the sore spot. Again, only proceed if you’re certain that your dog hasn’t sustained a serious injury. Once you’ve isolated the source, gently rub your hands around the area to warm up the muscles. Next, gently apply even pressure over the affected part of the body, pressing and releasing all while being mindful of not overdoing it. Try to establish a consistent pattern which will take the pressure off the tendons and provide relief. Finish up by gently stroking the sore area and then the entire body. As they age, dogs, like humans, tend to slow down. Increasing stiffness, the occasional sore spot, and age-related conditions such as arthritis or flare-ups from previous injuries all tend to come up on occasion, causing your dog to notice an increase in discomfort. Aim to incorporate this routine into your daily schedule and be prepared to notice a marked difference in your senior dog’s general well being. Ensuring that your dog is comfortable, begin the massage by gently applying pressure with your fingertips at the top of his head. Rub the side of the skull, the area by the jaw, and continue to work your way down the neck and to the shoulders. You may notice that some areas seem tighter than others—feel free to linger on these spots as long as your dog doesn’t show signs of pain. As you move your way down the body, use your thumbs to apply pressure along either side of your dog’s spine. Gently trace the length of the spine, continuing to apply pressure in a consistent pattern. Next, turn your attention to your dog’s chest and stomach. Using gentle strokes, rub your dog’s underside in a circular motion, helping to increase blood flow and encourage healthy digestion. Finish by gently kneading the arms, legs, and paws.